To quote one of the modern era’s most wise and influential philosophers, Saint RuPaul of Drag, “If you don’t love yourself, how in the hell you gonna love somebody else?” In that spirit, this week’s love and romance forecast appears to have very little to do with love and/or romance, but can directly lead to both. The reason why this week’s relationship outlook may not be all that noteworthy is because we are still coming down from the effects of Venus square Pluto, which (although it was exact last week) still holds sway over most of this week. That aspect is a lot better for overindulgence and feeding the wrong appetites than it is for seeking out love. So let’s talk about you, and specifically how you can get maximum mileage out of what is probably the year’s single most useful aspect: Saturn trine Uranus. Since both Saturn and Uranus are relatively slow planets, this transit has been going on for some time. But it is almost nearly exact on Monday, and that seems like a good time to sit down and have a good long talk with yourself and figure out what you want to change about your life. Saturn and Uranus are two incredibly different planets. The first one rules structure and order, and the other is the ruler of freaky brilliance and innovation. Put the two of them together with a positive aspect like the trine, and you can pull off nearly anything. But if this aspect has been in effect for months now, what makes this week, specifically Monday, so important? Monday is also the day that Mars in Capricorn turns direct after a long time in retrograde. Remember that any planet that is just coming off of a retrograde is particularly important, as from our perspective on Earth it appears to be more or less standing still in its path. Mars is all about drive and ambition, and when you combine that with the fact that Capricorn is the sign where Mars is exalted, this represents an opportunity that would be tragic to waste. Worst case scenario though: in the event you forget to enact your new Personal Action Plan on Monday, the aspect will be in effect for a while yet. 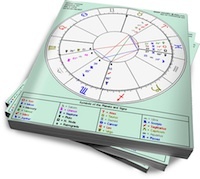 Besides, this week is also influenced by Mercury square Jupiter, so you can blame your lack of planning on that. Big ideas often arrive under that aspect, but you need to pump the gas a little to get them moving. So if what you seek is love and romance, start by using this week to make yourself a better, happier, and more viable target for it. Oh and of course, if all you want to do is get laid, well… Mars rules that too. Either way, use the energy wisely.